NickLannon.com: You Can Do Anything You Set Your Mind To: C'mon...REALLY? You Can Do Anything You Set Your Mind To: C'mon...REALLY? I watched The Astronaut Farmer the other night. I got it for $1.99 in a bargain bin at a Morristown record store. It was cute. Worth $1.99, but maybe not $6.00. Billy Bob Thornton plays Farmer, an ex-NASA astronaut who builds a rocket in his barn. He intends to use it to go into space, fulfilling a never-realized dream. His plan is going swimmingly (in that no one except his family and small town neighbors know what he's doing) until he tries to buy 50,000 gallons of high-test rocket fuel over the internet. In comes the FBI, suspicious that he might be building a weapon, and the FAA concerned he will show their multi-billion dollar budget to be unnecessary at best and might set a dangerous precedent for other amateur space enthusiasts at worst. Now, this kind of sentiment is held close to the human heart. Truth be told, though? It totally rubs me the wrong way. There are a host of other examples, the most ridiculous of which are the many professional athletes who claim that their recent championship is proof that "you can do anything you set your mind to." This is also a staple of movie star Reader's Digest-style fluff journalism. Question: "If you could tell people one thing, what would it be?" Celebrity Answer: "Stick with it. Don't let doubters get you down. You can do anything, as long as you're willing to put in the work." Gag me, please. Michael Phelps, the 14-time Olympic gold medalist, was interviewed after stepping out the pool following one of his gold medal wins. I can't find the clip online, but he was asked what the victory meant. His (paraphrased) quote was: "It just proves that if you want something enough, you can do anything." This is, to my mind, ridiculous. Did the other swimmers simply want the victory less than Phelps did? Would someone with a shorter wingspan, smaller muscles, and less ability to hold their breath underwater be able to beat Phelps, as long as their desire was sufficient? 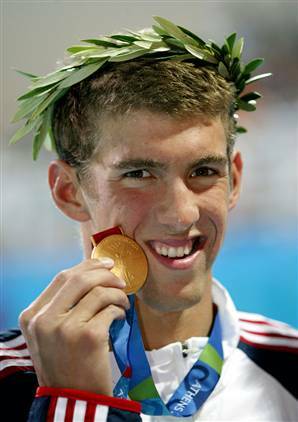 The problem with claims like Farmer's, or Phelps', is that they overestimate human ability. In any kind of honest assessment, we would have to admit that we can't do anything we set our minds to, and that sometimes, desire is not enough. Ask the silver medal winner. The Christian intersection is this: the more capable we feel as humans, the less likely we are to admit a need for a savior. The theological way to put this is "as one's anthropology (view of man) rises, one's Christology (view of Christ) must fall." If it were true that God helped those who help themselves, then hard work and belief would be necessary ingredients to a Christian life. But, thank God, that phrase is not in the Bible. It is good news, indeed, for those of us who can't win the big game, make the big shot, land the big role, or even competently live our own average lives, that God helps the helpless. But to understand that Good News, it helps an awful lot to realize that you're helpless, and that "You can do anything you set your mind to" is just a platitude.